The premise of "Deep Dive" is that there are four types of strategic thinkers. These four types of strategic thinkers embrace a very different approach to utilizing proven repeatable processes for building organizational strategy. "Deep Dive" takes into account our need as strategic thinkers to understand the type of thinkers that are most effective and a process for making the most of our limited resources while also taking smart steps to accomplish your goals. 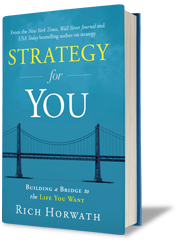 The four strategic thinkers are beach bums, snorkelers, scuba divers, and free divers. • Beach bums are strategic thinkers that sit on the shore and make an attempt to get into the water of strategic thinking; however, they do not contribute to the strategic insights which help businesses grow, and they average around 9% of all strategic thinkers. Charles Reade said it best in his most quoted maxim, “Sow an act and you reap a habit. Sow a habit and you reap a character. Sow a character and you reap a destiny.” The premise of "Habits of the Mind" is that you are what you think about. All of your thoughts shape and create whom you are, they mold you into the person you have become and whom you will be in the future. What we think shapes and determines our character and the outcome of our life.